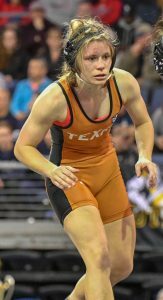 University of Texas senior Luciana Schement had to overcome a recent injury to claim the 2019 NCWA National Championship at 116 pounds. Just three weeks ago, Schement sprained her sternoclavicular joint. She was forced to sit out the Southwest Conference Championships as she worked to recover, and so she was understandably apprehensive coming into this weekend’s NCWA’s. “I was worried that I wouldn’t be 100%” coming into the tournament, said Schement. But, “After wrestling my first two matches [this weekend], I realized that my injury was no longer a concern, so I was confident going to the finals match.” Her confidence carried her to a 6-3 finals victory and her first National Championship award after finishing as the 2018 National Runner-up. Schement did not have an easy path to the finals. She first had to get past Allie Mahoe of Schreiner University, who Schement had lost to earlier this season. “We knew it would be a tough match and spent time before the match reviewing film and preparing a game plan,” said third-year coach Andy Josuweit, an alum of Bentley University where he founded their NCWA wrestling program. Schement and Mahoe traded takedown attempts in the first period to no avail, each racking up a stalling warning for backing out of bounds. Mahoe turned that stall warning into a point in the second period as she shot Schement off the mat late in the round, and Schement was called for her second stall of the match. Down 1-0 to start the third period, Schement elected the bottom position and quickly escaped to tie the match. In the final seconds though, Mahoe appeared to have a hip toss locked but Schement somehow scrambled and appeared to have both legs thrown in from top. The referees ruled time had ran out before the takedown was secured. The University of Texas coaches challenged the call, but the call stood and no takedown was awarded. The first sudden victory period ended with no points being scored, and then Schement rode out Mahoe in the first thirty-second tie-breaker period. On Mahoe’s turn at the ride-out, Schement quickly got to her feet again. Mahoe could not return her, and the referee hit her for a stall before she eventually cut Schement free. Schement would go on to secure the victory 3-1 and advance into the championship match. Schement chose to start from bottom in the second period, and she showed again her unwillingness to be held down, reversing her opponent within the first twenty seconds. In the third, Schement defended Wilson’s own high crotch attempt to a stalemate, but was later warned for stalling with about forty seconds remaining. Wilson attacked again, and this time she secured the takedown to bring the score within one point. But, said Schement, “When I looked at the clock, I realized that there was only six seconds left and my concern vanished.” After a reset to neutral and a riding time point awarded, Schement secured her championship victory with a 6-3 score.